Young Tillie Pierce and a friend who wandered near the battlefield after the first day of fighting at Gettysburg were horrified at the sight. They were so overcome by the sad and awful spectacle that they hastened back to the house, weeping bitterly. Tillie, unlike most Northern children, witnessed the Civil War at her doorstep. The author examines how the war affected and changed the lives of youngsters from the North who lived through that time, giving examples ranging from the thoughts of twelve-year-old drummer boy George Cleveland to the “Sanitary Fairs” hosted by cities and towns to raise medical funds. A professor of history at Milwaukee’s Marquette University, Marten has written and edited several books about the Civil War. 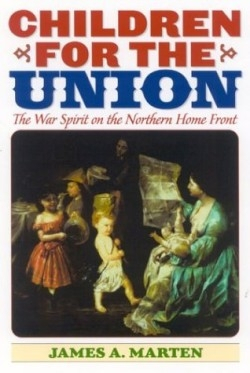 Subsequent chapters describe the war culture, family life, and the war’s aftermath. Readers are introduced to memorable and sometimes historic figures, such as Elmer Ellsworth, the first man from the North to die in the war. A close friend of Lincoln, the twenty-four-year-old became a martyr for the Union cause. It’s interesting to read the many ways in which children helped in the effort. For example, they made “housewives” (small leather folders containing sewing supplies) for the soldiers, and were mobilized by Chicagoan Alfred Sewell who recruited them to sell pictures of “Old Abe,” the bald eagle who was the mascot of a Wisconsin regiment, accompanying them through several battles and becoming a national celebrity in the process. For history buffs or those looking for a primer about the Yankee war effort at home, Marten’s facts have a welcome human face, since he relies heavily on the memoirs of those who experienced the war first-hand.